Kombucha (kom-BOO-cha) is simply fermented tea. It has been consumed for thousands of years for its health benefits! The first recorded use of it dates back to around 220 BC in the Chinese Tsin Dynasty, where it was known as the “Tea of Immortality.” The name of it is derived from the words Kombu (meaning “kelp”) + cha (meaning “tea”). Although many people refer to it as “mushroom tea,” that is really a misnomer. Actually, neither kelp nor mushrooms are used in brewing this beverage! Okay, so how is it made? 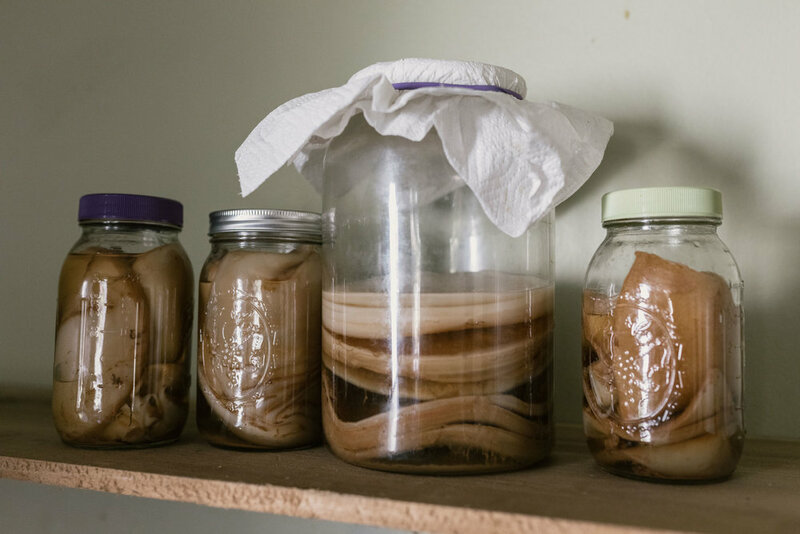 First, a SCOBY (Symbiotic Colony Of Bacteria and Yeast) is needed, which is a rubbery, squishy mass that ferments the sweetened tea. There are several teas that can be used: black, green, oolong, white, or yerba mate. The SCOBY is alive and needs food to keep growing and reproducing! It does so by metabolizing the sugar in the tea, producing alcohol molecules as a byproduct. Each time a batch has fermented sufficiently, it is removed from the “mother culture” and bottled as the fizzy probiotic beverage we know and love! While there is still much research yet to be done on its effects on the body, kombucha drinkers around the world claim many health benefits from acid reflux relief to improved skin health! Kombucha is rich in probiotics and organically occurring antioxidants, B vitamins, amino acids, and many other bioactive compounds! B vitamins promote focus and energy and protect against stress and depression. The beneficial bacteria (probiotics) in this drink colonize in the intestines, promoting overall gut health, while naturally occurring acids fight off harmful pathogens. Studies have also shown that kombucha helps to protect the liver from toxic pollutants. If you want to promote your energy, longevity, and immunity in a convenient and tasty way, kombucha might just be your new favorite thing! There are many brands and flavors to choose from at Health Nut. Ask for a punch card at the register—for every ten bottles you purchase, the eleventh one is on us.